It goes without saying that we're 100% beauty obsessed here at Byrdie HQ. And thankfully we live in an ever-evolving, ever-inspiring world that never disappoints when it comes to eye-catching intrigue. We also know that beauty is complex, rich in culture, born and reborn, and perpetually changing. As beauty editors, our high of choice is a perpetually piqued interest in the people we see both across from us at the office and across the globe (Just wait until March when we kick off an entire month's worth of global beauty content.) And one amazing benefit of the job is having the opportunity to get up close and personal with the brands and people who fuel the fire where industry-shifting beauty takes place. One such example: my meeting with the founders of Scandinavian-born and Scandinavian-inspired skincare line Eleni & Chris. The goal: comprehensive formulation inspired by the beauty pillars of Scandinavian people, geography, and tradition as a whole. So naturally, I needed to know more. Keep reading to learn countless Scandinavian beauty secrets and what makes the founders (and their signature Scandinavian glow) tick. Though Scandinavian summers (on average) are warm and balmy with highs in the 60s and 70s, the winters can be brutally cold (think 30 degrees and under). Therefore, maintaining the skin's hydration levels and moisture barrier is paramount for a perennial Scandinavian glow. The essentials: a strategic routine of cleansing oil, serums, face mists, and sheet masks. "In the winter, when the weather gets cold in Scandinavia, I always switch to a cleansing oil, as it leaves the skin hydrated, super smooth, and can completely remove my mascara," Christinah shares. Then an effective serum is an absolute must for layering intense hydration—using both a serum and day cream rich in antioxidants is key—and fast-absorbing, light textures are preferred over heavy formulas. Additionally, makeup-friendly face mists are winning out over basic toners across Scandinavia. "I am also completely addicted to face mists—I love ours with precious cloudberries—to stay balanced and moisturized throughout the day," says Christinah. "They deliver instant hydration and are easy to layer. I also recommend sheet masks and try to do one about twice a week. I keep them in the fridge so I can wake up in the morning to a cool and refreshing ritual that gives that instant glow to my skin." So how does the Scandinavian's approach to skincare differ from other parts of the world? After all, staples like cleansing oils, serums, and sheet masks have been gaining global popularity, and if you took a peek at our cabinet at home, you'd find much of the same. However, according to Christinah, the main difference will likely be found in the quality and quantity of the product regimen. "Less is more, performance is key, and we tend to prefer products that are easy to use and have multiple benefits." In other words, you won't likely find 10-step skincare routines lurking on their bathroom vanities. For Scandis, it's all about functionality and results. Known for gorgeous landscapes and rich natural resources, another Scandinavian beauty secret is making the most of the geography around them—a culture-wide value and something that's easy to see if you were to examine the ingredients and inspiration behind Eleni & Chris. "When we were developing, our goal was to formulate our products from a selection of the purest ingredients sourced directly from the Scandinavian environment," Christinah explains. So what do the Scandinavians have that the majority of the world doesn't? Fjords, glaciers, and precious cloudberries—sometimes, right in their backyard. It's safe to say that berries have had a major health and beauty moment within the industry these past few years. Of course, there's the more standard fare like blueberries, strawberries, and raspberries and the slightly more exotic (and apparently Instagram-worthy) açaí and goji. However, relatively unknown in this part of the world, and in a league of its own, is the cloudberry. And yes, its benefits are just as dreamy as the whimsical name would suggest. In fact, as Christinah explains to me, the berry is one of Scandinavia's best-kept natural skin secrets and a key component of their luxe line of skincare. "Cloudberry is the most significant discovery in anti-aging ingredients for over a decade. Extremely rare and prized for its arctic provenance, this rare berry naturally contains vitamins A, B, C, and E, as well as calcium and magnesium. A single Cloudberry contains as much as four times more vitamin C than an entire orange, helping skin to look younger for longer." We knew fish was a staple in the Scandinavian diet, but according to Inger and Christinah, omega-rich oils are an essential component of their skincare makeup as well. So much so that the duo went ahead and created an ultra-pure and patented version (SEA3oil) for their line. What's more is that while most omega-rich oils are tinged yellow, Eleni & Chris's SEA3oil is crystal clear due to its purity—the crème de la crème of fish-born oils if you will. Exercise, diet, makeup, and skincare are all connected for Scandinavian women. "I would say we have a very holistic approach to beauty," muses Inger. "We strive to find the balance in all the important aspects of health: what to eat, how to exercise, what to apply to the skin, and how to live our happiest life. If you're happy, your face radiates a certain kind of glow no makeup or quick-fix can ever achieve." And her daughter agrees: "It is very much a combination of maintaining an active lifestyle and prioritizing a healthy and colorful diet." When I press for specifics, Christinah says it's all about the berries and fish, which, she says, work wonders for the skin. "Spending hours outside in fresh air, eating healthy food, and being active is built into the traditional Scandinavian lifestyle and it definitely impacts how we approach wellness and beauty as well." This one might not be for the faint of heart, but one special Scandinavian beauty secret we learned firsthand from Swedish model Karin Agstam is the benefit of splashing your face with ice-cold water first thing in the morning (a chilling thought, we know). "First thing in the morning, I wash my face with ice-cold water. I make a bowl out of my hands and drink 10 big gulps of water from the tap. I've done that as long as I can remember." Although a word to the wise: This might not be advisable depending on where you live and where your tap water is sourced. (Agstam grew up in north Sweden where her family had their own well, which offered fresh, crystal-clear water.) Thus, try keeping a filtered water pitcher filled with ice-cold water in the fridge and replicating the practice that way instead. But the ice-cold water trend doesn't stop there. "I end each shower with a couple of seconds of ice-cold rinse," she tells us. "Bathing with cold is an ancient technique called hydra-therapy, and it works on the sympathetic and the parasympathetic nervous system as a reset button, almost like a therapy session or a lymphatic massage. It clears away nervousness or anxiety and sets me up for a great day." Our verdict? Try it if you dare. But what about makeup? When I had the chance to meet Inger and Christinah in person, I immediately noticed their clear, fresh complexions, crystal blue eyes lightly rimmed with black, and a natural pop of color on the lip. And according to the mother-daughter duo, this tends to be the norm when it comes to the Scandinavian makeup aesthetic. In general, the ultimate makeup look will epitomize a minimal approach with limited products while placing a high precedence on high-quality formulas, performance, sustainability, and environmental friendliness. "We're uncompromising when it comes to product quality and performance. Ultimately, we'd rather have fewer products that we know will actually work," adds Christinah. Translated: they don't forget their scalp. "Due to the seasonal weather, Scandinavians have become quite conscious when it comes to scalp health," Inger shares. "It is often an area of the skin that is left behind and a healthy scalp is the best foundation for glamorous hair." And considering the scalp faces many (or all) of the same environmental and challenges that our faces do (like dehydration, build-up, and sensitivity or irritation), the theory makes sense. So what's their secret for healthy and voluminous strands? Products with a mean ability to multitask. "Scandinavians look for haircare products with multiple benefits, including high-quality ingredients that encourage scalp health," Inger continues. "This ensures you're taking care of every part of your skin." 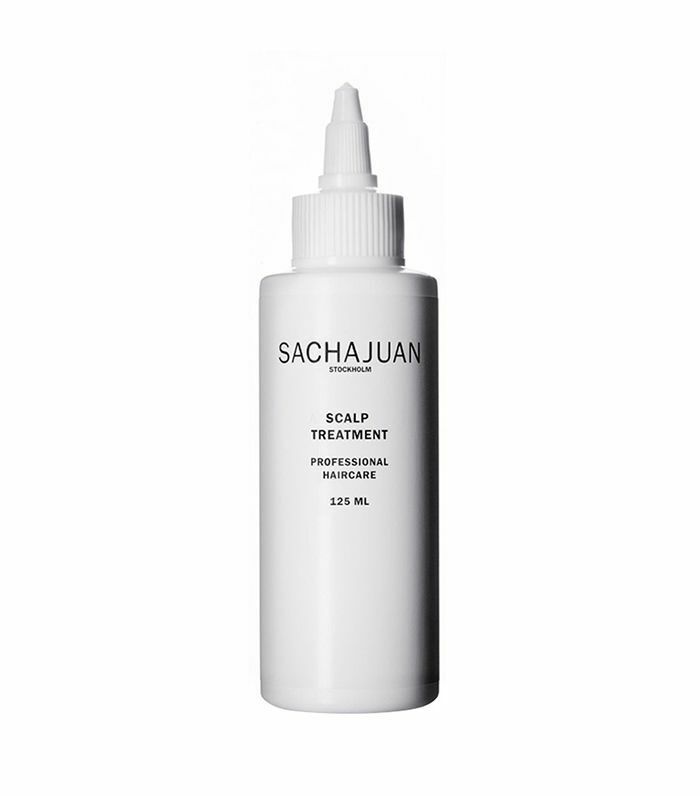 Not surprisingly, Swedish haircare brand Sachajuan boasts scalp-oriented products like the targeted treatment above, and Eleni & Chris's haircare line (including their luxe scalp-balancing shampoo, conditioner, and lotion spray) is equally amazing for fostering healthy, glamorous strands. You can check out the entire Eleni & Chris line here. Ed. note: Quotes have been adjusted for clarity.